Coloured etching with aquatint of the new buildings on Chowringhee in Calcutta by Thomas Daniell (1749-1840) from his 'Views of Calcutta' published in 1787. Chowringhee Road (now Jawaharlal Nehru Road) runs along the east side of the Maidan, a large open area of land in the centre of Calcutta. 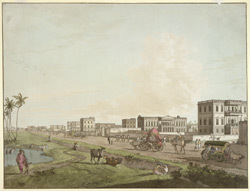 In the late eighteenth century, Chowringee became the main European residential area of Calcutta and was characterised by Palladian houses that were set in spacious grounds.